My blogging safari title says it will be about “Africa and me”. This is one of the “me” parts. I really enjoy living in Downtown Kingston. I can walk everywhere. I almost feel annoyed when I have to get in the car. With the amount of air travel that I do I can’t claim to be saving the planet from the changing climate but I hope that the exercise of daily walks is keeping me a bit fitter. 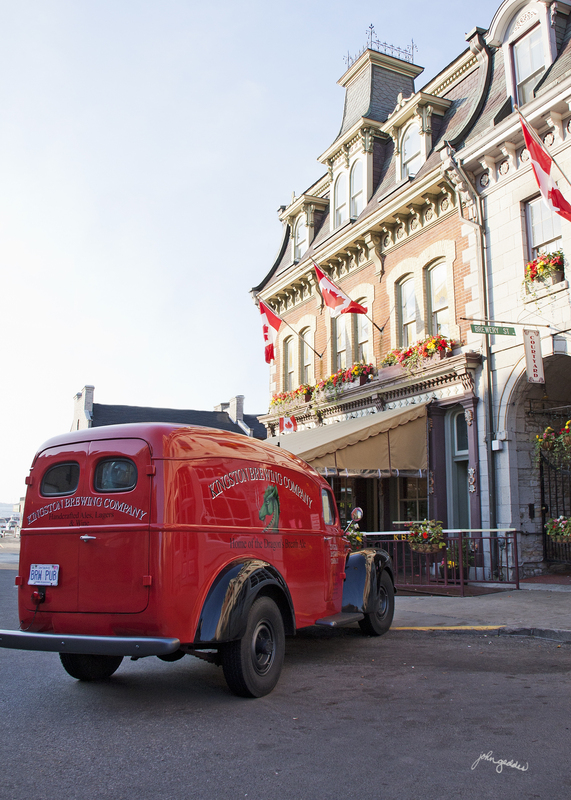 The city core is lively and entertaining throughout the year, with lots of great restaurants, coffee shops, patios, the Lake Ontario waterfront and the start of the 1000 Islands of the St. Lawrence River. Many outdoor events are held over the summer – concerts, buskers and music festivals, triathalons, parades – but Canada Day celebrations that happen in the centre of the city every year are something that I really look forward to. On July 1, the streets start to hum early in the morning with people dressed in red and white heading to the streets and parks around the Market and City Hall. The annual “parade” down Princess Street is just a gathering of happy Canadians who are out in the July sunshine waving Canada flags and celebrating the birthday of the country they are proud to live in. 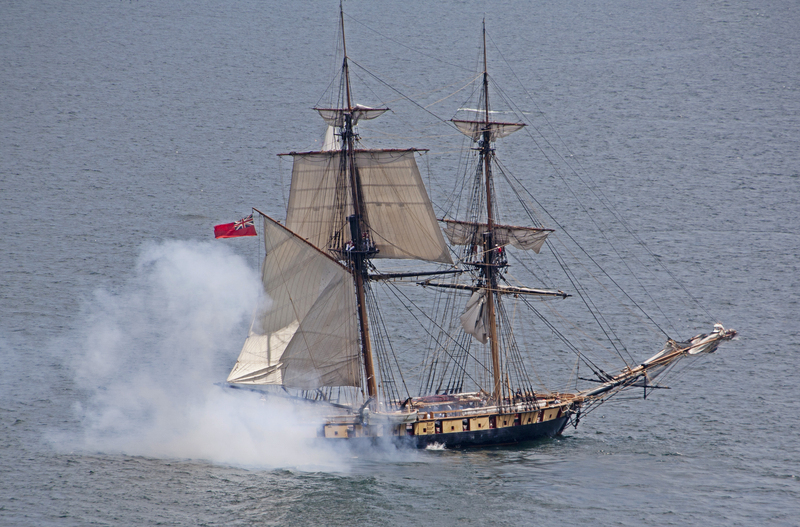 This year the waterfront was the scene of a re-enactment of the Flight of the Royal George – one of the largest war ships on the Great Lakes in 1812. On a blustery November day, 200 years ago, the Royal George was chased along the shoreline of Lake Ontario by American ships who wanted to capture it as a trophy. Eventually the chase ended right in front of Kingston Harbour. In fact, the last battle took place exactly in front of the place where I now live. And on July 1 this year, it became the site of a re-enactment of the whole chase, complete with cannons firing from the ships and several sites along the shore. Unlike what would likely have been a dreary November day, the re-enactment took place under sunny skies with great gusts of warm summer wind to propel the ships along. 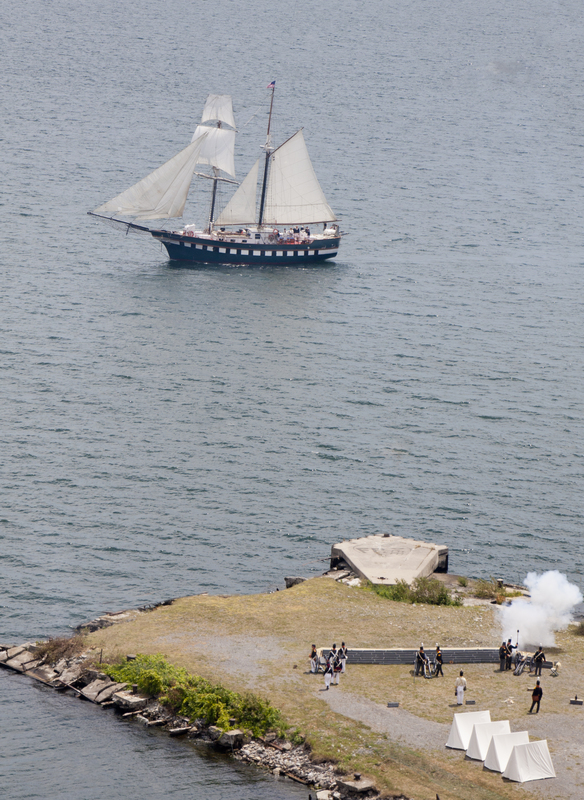 The boom of cannon fire both from the shore and the ships echoed out over the city and the shoreline was lined with tourists and Kingstonians who were there to enjoy the re-enactment. As in the real battle 200 years ago, the Royal George escaped unscathed and those pesky Yanks were driven back into submission. The historic re-enactment was both entertaining and a reminder of the history of the very property that is now my home. What a great way to celebrate Canada’s history with other Canadians. And the bonus? We won the battle! Canada Day in Kingston tops off with a fireworks display over Point Frederick. 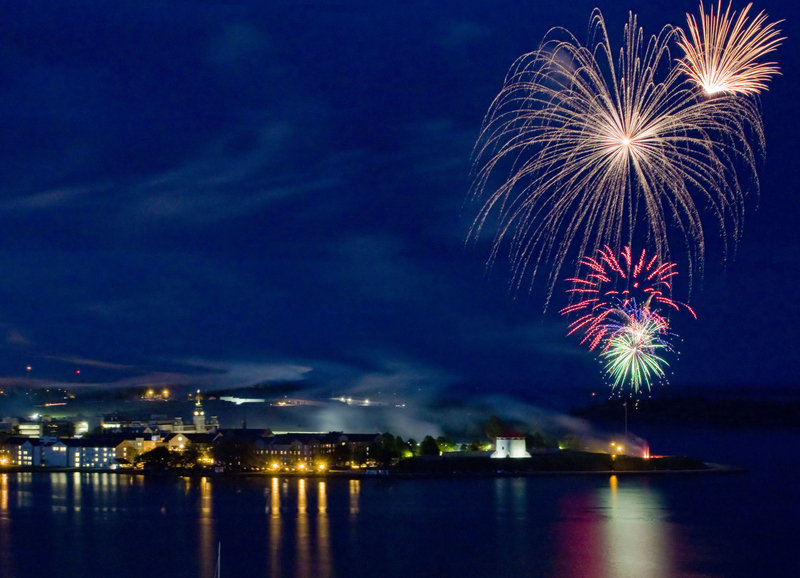 The downtown core swells again in celebration as hundreds – no, thousands – of people gather along the lake shore to watch the colourful explosions burst over historic Fort Henry. And once again – lucky me. The best view in town happens to be from the rooftop of my apartment buidling. This entry was posted in Uncategorized and tagged 1812, boats, Canada, Canada Day, City Hall, downtown, fireworks, Kingston, Ontario, Re-enactment by johnageddes. Bookmark the permalink. John, I couldn’t agree more! Downtown Kingston is a wonderful place to live…it’s benefits often go unappreciated by some who live in the suburban areas…it’s really not that hard to find a parking spot, folks! This final photo of the fireworks should be on a post card!